Few things get me more angry than the fraudulent presidential debates. People get all patriotic and go around acting like we have this great institution that supports free speech and allows everyone to hear for themselves all the details on all the issues of the day. But that’s a load of crap. The presidential debates are a propaganda trick to distract the American voter from the fact that they are being milked like cows by the welfare/warfare machine and conned into thinking they have a choice. Think that sounds a little extreme? Well, Walter Cronkite called the debates a “fraud”. The League of Women Voters refused to continue their sponsorship saying they “wouldn’t be an accessory to the hoodwinking of the American voter“. Here are a few paragraphs from OpenDebates.org on the sordid history of this criminal gang. Did you know the two men that created the Commission on Presidential Debates were the heads of the Democrat and Republican parties? Did you know that they create secret agreements that spell out every detail of how the debates will be run? I started thinking about how to take action and I came across Rick Stewart of “Help the Commission do it’s Job”. Rick has been instrumental in the effort to get the Commission’s sponsors to drop out. I asked him to write a post and here it is. Our organization (HELPtheCPD) was originally formed to convince the CPD to act responsibly. They are in charge (I thought – more on that later) of the presidential debates. I noticed they were very primitive in their use of feedback mechanisms. No Facebook page, no Twitter account, no ‘contact us’ information on their website. They didn’t even provide their phone number and mailing address. I found an email address that was rumored to work (jb@debates.org) and asked them to provide a ‘contact us’ page, but never heard back. This annoyed me, so one Sunday afternoon I hunted down some contact information for their Board members, using Google, and made the same request. Again – no responses. This annoyed me even more, so I sent out a more ‘severe’ request, and actually received a couple of replies. Unfortunately, those replies were nonsensical. One actually said something like ‘don’t get annoyed, you can contact us on our website.’ This was just plain wrong – nothing had changed on their website. Of course that was from a guy who fought in World War II, so maybe his idea of the Internet was a bit different than mine. This whole episode convinced me the Commission was barely functioning in the 20th century, and needed a little enlightenment. I set out to do that, first with a Facebook group called ‘Help the Commission on Presidential Debates do its job,’ then by driving from Iowa to Washington DC and promising to print out a hard copy of everything people posted to that Facebook page, and hand deliver it to the CPD. The story from there on out is complicated but parts of it are worth retelling. I arrived in Washington on a Monday afternoon, and stopped in the CPD for a courtesy call. Instead of being welcomed into their office they barely cracked the door and wouldn’t even stick their head out – sort of like a rural widow on a dark moonless night when a stranger knocks on her door. They wouldn’t even let me leave a short written message, but insisted it be taken downstairs to the security guard, who could then bring it back upstairs to them. It was obvious something was wrong at the Commission headquarters. On Tuesday I hand delivered 7 letters, printed out from the FB page, to the CPD. On Wednesday I hand delivered 66 letters. On Thursday they told me they were no longer accepting hand deliveries, nor would they accept private messenger deliveries, FedEx deliveries, or UPS deliveries. Truly bizarre. I asked the security guards for their mailing address, and was told they would get it for me. Then on Friday, when I returned to get the CPD mailing address, I was told that if I ever came back to the building I would be arrested. At this point I really ceased taking the CPD seriously – how could I? We had been working on a website to make it easy for people to communicate with the CPD, but instead we turned it into a parody website. There was really nothing to do but laugh at them, and I’m laughing at them even as I tell this story. For some minor diversionary moments you can browse our juvenile humor at www.debates.ws. 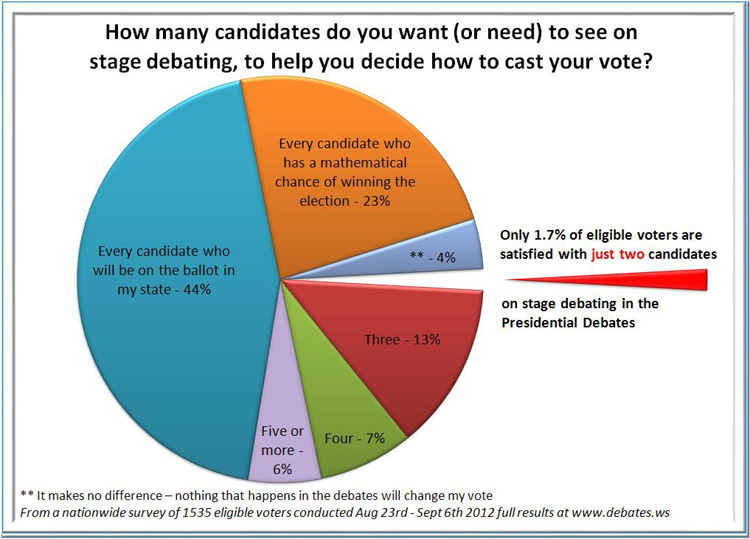 The next few weeks in Washington were useful, but the best thing we did was conduct a nationwide survey asking a very simple question to eligible voters – how many people do you need to see on stage at the presidential debates, in order to help you decide how to cast your vote? We published the results after we had 1535 respondents, and now we have almost 1800 respondents. I must admit, the results were, and still are, astonishing. I intuitively felt a lot of people wanted to see more than two people in the debates, but I never expected 98.3% of them would. That’s right – only 1.7% of our survey takers were satisfied with just two candidates. Most people simply wanted to see everyone who was going to be on the ballot in their state (44%) or every candidate who had a mathematical chance of winning the election in the electoral college (23%), the rest specified three (13%), four (7%), and five or more (6%). Oh yes – 4% said it didn’t make any difference, because nothing that happened in the debates could possibly change their mind. I keep wondering – what if a candidate took off a mask and revealed itself as an alien – would that change these people’s minds? Of course I had a problem with my survey results, because I had no way to deliver them to the CPD. Eventually I printed out nice color copies of the pie chart, laminated them, and hand delivered them to my two US senators. I had nice private sessions with the senators, and both promised they would do their best to discover the mailing address of the CPD. The CPD had actually told me their mailing address was available only on a ‘need to know’ basis. This is so unbelievable I am fortunate to have two eye witnesses, otherwise I might not even believe it myself. ‘Need to know’ basis – like a national security secret. I also recruited 31 people from 31 states to send their two senators a copy of the same graph, with instructions to do their best to get it into the hands of the clowns at the CPD. I am sorry if I sound flippant, but their behavior is so unrelated to the reality I live in it is very hard for me to take them seriously. Then I drove back to Iowa, because my brand new grandson, born in London, was going to be home for his first visit. Family comes first, even before activism. During the course of the work in Washington I slowly began to realize – it was not possible to reform the CPD. They were not just behaving bizarrely, they were actually created for the express purpose of preventing any third-party candidates from being in the debates. They weren’t paranoid delusionals, they were doing the job they were programmed to do, and doing it well. To do anything that would give a third-party candidate even the slightest chance of being in the presidential debates was simply impossible for them to contemplate – their stated mission was to prevent it. At this point it became obvious we had to go after rational actors, not try to reform the CPD. So we looked at the debate sponsors. A quick analysis showed something peculiar – for the most part nobody stayed on as a sponsor for very long. Most companies tried it one year, then never again. A couple lasted two years, but there were only four long-term sponsors, and each of them could be explained. The Howard Buffet Foundation was a sponsor in 2004, 2008, and 2012. Well, Howard Buffet is on the board, and was just given another $1.03 billion by his father Warren. That makes sense – use some of it to sponsor the debates. Otherwise, he’s just the world’s wealthiest corn farmer. Anheuser-Busch has been sponsoring since at least 1992. That makes sense, too, since Senator John Danforth from Missouri is on the CPD board, and must have been hobnobbing with August A. Busch III and August A. Busch IV, the big cheeses, in St. Louis. You rub my back, I’ll rub yours. There were two other sponsors with slightly murkier backgrounds. Sheldon S. Cohen, Esq – sponsor since 1992 (skipped 2000). I don’t know for sure what is going on, but Sheldon used to be the Commissioner of the IRS and, as you can imagine, the IRS doesn’t like it when a tax-exempt 501(c)(3) organization like the Commission on Presidential Debates plays political hankey pankey. Enter a former Commissioner – problem solved. The last sponsor I don’t even have a conspiracy theory for – the Kovler Fund (previously the Marjorie Kovler Fund). I’ve been scratching my head on that one, but at this point can only guess there is a smoking gun of some sort. It may, or may not, be a private foundation. It probably has some personal connections to some bigwig Republicans and Democrats. But what do I know? Back to the non-murky sponsors, we discovered they all had excellent reasons to drop their sponsorships. BBH New York, part of BBH London – the Brits were sponsoring our debates. Until the French bought them, that is – Publicis Groupe. A little poking around revealed this – Publicis had a strict policy against doing work, paid or pro bono, for political organizations. I pointed this out to them, they whimpered, I provided the evidence, they folded. That was last Monday. Then I discovered the YWCA had a brand new CEO coming to work this month. Now why on earth would she want to step into this kind of controversy her first day on the job? It turned out, after she learned the facts, she didn’t. On Wednesday they pulled their sponsorship. Philips Electronics was a bit tougher – it took about 36 hours. For most of Thursday they replied to our emails along the lines of ‘we are proud to be a good citizen’ and ‘the CPD is non-partisan.’ After dozens of people pointed out otherwise, Philips went suddenly quiet on Thursday afternoon. Friday morning we took the liberty of asking their Dutch owners to join the discussion, and on Friday evening they disappeared as a sponsor. Today (Saturday) they explained why – the CPD was, actually, nonpartisan, but they looked bipartisan, and Philips wanted to avoid even the appearance of guilt, so they jumped out. That’s all we were asking them to do. Now we want to convince AB InBev, the Belgian owner of Anheuser-Busch, to do the same thing. And it turns out AB InBev also has a corporate policy against political meddling. If enough people point this out, it seems unlikely AB InBev will really want to keep their Belgian noses poked into our American elections. There must be something more productive to do with their time and money. Southwest Airlines is also on our list. We have received written confirmation their senior management thinks the CPD is ‘nonpartisan.’ But we think they haven’t looked closely enough at the facts, and are requesting them to look again. Perhaps a hundred such requests. No one knows for sure, that’s the nature of grassroots organizing. It seems likely the International Bottled Water Association will also change their mind, although on Thursday and Friday they seemed reluctant to do so. What is hilarious is this – all they are donating is a bunch of bottled water. Why would they possibly want to jump into this controversy, when they can just take their name off the ‘National Sponsor’ list and be done with it? We think they need just a smidgen more persuading, and we plan to provide it. That leaves the two possibly impregnable organizations and one individual listed above, and the huge Washington law firm Crowell & Moring. One of their young bucks has been working with the CPD since 2000, before he even went to law school, probably because he went to Williams College, where the CPD Executive Director Janet Brown also earned her degree. Old school ties. But why should this guy, who is providing the CPD with pro bono legal work, want to jeopardize his entire law firm – hundreds of partners, it looks like – by getting them listed as a ‘National Sponsor’? Even if he believes in his heart that third-party candidates will spell the death of America as we know it, do all the partners believe the same thing, and want to say that out loud? We are just asking him to drop the ‘National Sponsor’ part, and do his pro bono work in the dark of the night like everybody else. OK, there’s the story. Now how can other people lend a hand? The easiest and most effective thing to do is join the Facebook Group ‘Help the Commission on Presidential Debates do its job.’ We post relevant information there, including victory announcements. For the most part all we ask people to do is write a coherent email, to a selected group of influential people inside a sponsor organization. Enthusiasts can also make phone calls, of course. It isn’t so much what we are saying that counts – the message is simple. The CPD is not a nonpartisan organization, it is a bipartisan organization. They claim to want to ‘inform’ us, but in fact they want to hide third-party candidates from us. We don’t even object to that so much, what we object to is the fact they openly lie about it, and so far the national media has simply swallowed that lie for one month every four years, without bothering to investigate it. Since the national media won’t do their job, we are doing it ourselves. And, so far, we have been pretty successful. The truth doesn’t hurt, unless you try to avoid it. We just put the truth out there and let it do its work for us. Thank you, Rick Stewart for charging forward under the flag of truth. America deserves more than to be turned into a nation of sheeple. Obama did me a great favor by so flagrantly demonstrating that for all his supposed contrasts to the “establishment”, he simply took the entire Bush program, as profoundly self-serving as it was, and slid it over into his administration. This was the fox promising to protect the hen-house from the wolf only to reveal himself to be as voracious as all the other predators. Now he wants a plaque mounted on the corridors of history labeled “Obamacare.” How pathetically self-aggrandizing. Most families are hurting with parents, relatives, recently graduated sons and daughters who pursued dreams of an educated and productive future – all out of work. What does that say to communities challenged by limited resources, looking for signs of hope in their lives as they witness others who appear to fit into the “American” dream, who are themselves looking for hope today? This is not “us versus them” being played out on the national burlesque stage. This is not about one party or another. This is about the rules of the game being changed by a bipartisan monopoly. Time for all to wake up, question, listen, learn, stand up, speak out and be counted. The American people have fought, died, sacrificed and payed dearly for an historically unique and unequaled demonstration of democracy. At this stage in it’s life cycle, this means providing a forum for more than 2 parties who have agreed to divide the spoils between them, but for multiple parties and candidates that can give the voter the real choices he/she deserves! As many lawsuits as can be filed should be filed asap against the Commission on Presidential debates. These exclusive debates which deliberately violate the 1st Amendment of the US should be bombarded w law suits from as many organizations as possible. Please locate lawyers and law firms that genuinely care about true justice for our country, and have the expertise to ensure justice prevails in nationally televised Presidential debates. And, keep the lawsuits coming. Third party candidates, some of whom are on the ballot in all 50 states, deserve to be heard by the American people. Please pursue justice. Have this Commission uphold the free speech rights of legitimate candidates for the Presidency by enforcing the law of the 1st Amendment.